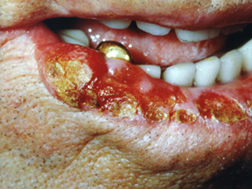 Oral cancer is cancer anywhere in the front of the mouth. It includes any cancer on the lips, tongue, inside surface of the cheeks, hard palate (the front of the roof of the mouth), or gums. Cancers in the back of the mouth, such as on the soft palate (the back of the roof of the mouth) or the back of the throat, are not considered oral cancer. Oral cancer is a type of cancer called squamous cell carcinoma, in which surface cells grow and divide in an uncontrolled way. Oral cancer occurs more often in men than in women. The number of new cases of oral cancer has been slowly decreasing over the past two decades.